Three weeks ago I published a detailed look at the real-time GOES-17 satellite images (see GOES West and the streakers). These images are published on an experimental website run by the University of Colorado. It is quite illuminating and indeed exposes the geoengineering as it happens, assuming you know what you are looking at. As such, I wonder how long the perpetrators will leave this up for us to observe the emperor’s lack of attire. You can go back via the link above to see the whole article, or straight to the current GOES-17 loop via the link below. The above link takes you to the current animated version (last three hours). To the right is a snapshot of the February 5th animation. 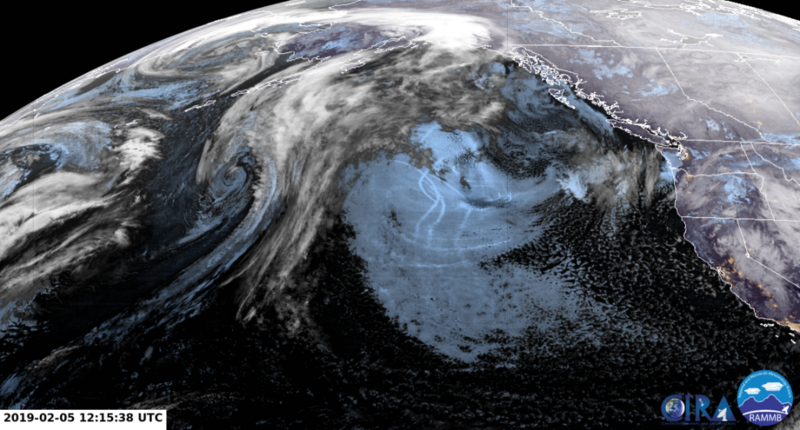 Yesterday I watched a fascinating display of the telltale geoengineered clockwise rotation pulling north Pacific air up into Alaska and Canada to loop down on central USofA with an Arctic vengence. Off the southern California shore was a normal counter-clockwise rotation of moist air. At the intersection of these two rotating masses was a semi-clockwise band being pulled due east. That band was thick, heavily moisture ladened and blatantly unnatural. That freak of non-nature just dumped a nearly-unprecedented 8-10 inches of snow on us here and is likely to continue for another 4-6 inches before it runs out sometime tomorrow. I am surrounded by people who comment on the vicissitudes of nature.